Secondary hypertension is a type of hypertension with an underlying, potentially correctable cause. It is much less common than primary hypertension, affecting only 5% of hypertensive patients. The symptoms, physical examination, and routine laboratory tests may help to identify such patients. In particular, patients in whom hypertension develops at an early age and also patients with resistant hypertension. Kidney disease is the most common cause of secondary hypertension. Chronic kidney disease and systemic hypertension may coexist in two distinct settings. First, primary hypertension is an important cause of chronic kidney disease. Second, kidney parenchymal disease is a well-established cause of secondary hypertension. The pathology can arise from either the kidney parenchyma (the functional tissue of the kidney) or maybe renovascular (blood supply to kidney) in origin. Is a more common cause of secondary hypertension as compared to renovascular disease. In young adults, kidney parenchyma disease is one of the most common causes of secondary hypertension. Kidney parenchyma disease causes normal physiological functions of the kidney to be impaired. Thus, a state of sodium/volume balance in our body may become abnormal and it will manifest as high blood pressure. Examples of kidney parenchyma disease are diabetes and inflammatory glomerular diseases, chronic kidney infection, and polycystic kidneys. 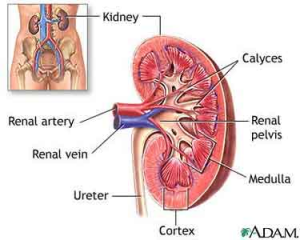 In renovascular disease, there is narrowing of the artery that brings blood to the kidneys. Atherosclerotic renal artery stenosis (ARAS) is commoner in elderly and is an important cause as it can lead to end stage renal failure (ESRF). It is also associated with coronary heart disease, cerebrovascular disease and peripheral vascular disease. 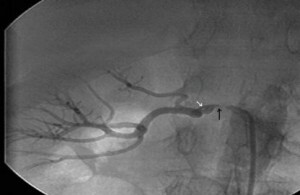 Renal angiography including measurement of the pressure gradient is the gold standard in the diagnosis of renovascular hypertension. Figure 3 : Renal angiography : Severe narrowing (black arrow) in right renal artery with a white oscillating area (white arrow). Diagnosis of Secondary Hypertension: An Age-Based Approach. Am Fam Physician. 2010 Dec 15;82(12):1471-1478. Secondary hypertension is more common than primary hypertension. 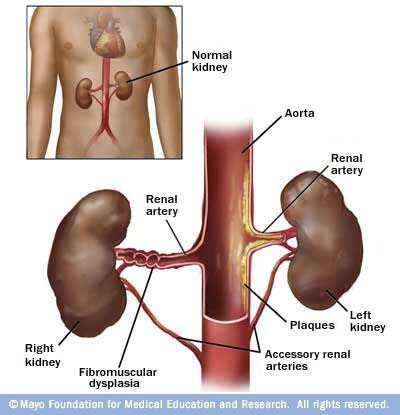 Atherosclerotic renal artery stenosis can lead to end-stage renal failure (ESRF).